Situated west of Pašino brdo, Mala Kula is situated on the ridge of the Grdonj hill. In Austro-Hungarian military it was categorized as guardhouse (Wachthaus). It is a standardized two-story building with two square-shaped protective “kaponiera” (cases) that provide close-in defence of small arms. Loopholes for small arms were amplified using iron plates. Placed above the entrance were small casemates made of the same material with two loopholes. Two other fortifications – Palež and Čolina kapa, were built in the same type. During the siege of Sarajevo, Mala kula was situated on the very frontline. After extensive renovation today it hosts the Museum of 105th motorized brigade. 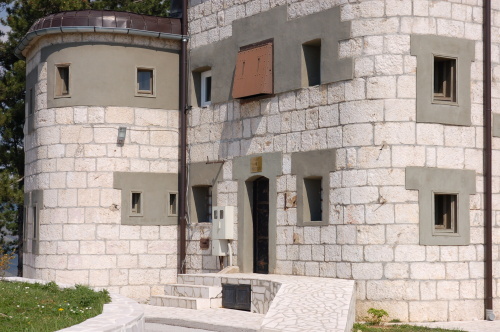 it had been built by the Austro-Hungarian Army as a part of the Sarajevo fortification system from 1882 to 1908, Mala kula on Grdonj was one of the typical fortified guardhouses. It hosted the Austro-Hungarian Army up to 1918. The outline of the building is rectangular (9.75 x 9.15 m) with extensions of elliptical towers added to the eastern and western sides of the building. Its height is 6.95 m, containing ground floor and the first floor with height of 2.94 m. The original roof is flat-moulded with the fascia height of approximately 1.10 m. The towers are covered by tin. Well preserved, reconstructed and revitalized, it hosts a contemporary Museum. Part of the fortification system “Fortress Sarajevo” (Festung Sarajevo), built from 1882 to 1908 with purpose to strategically protect city of Sarajevo from possible military incursion from Serbia or Montenegro. System was heavily armed and on standby in 1914, as the Montenegrin army advanced, but was never employed in battle since the theatre of war moved to the southeast in 1915. Facilities were later used by Yugoslav armies, both royal and JNA. Ministry of defence of Bosnia and Herzegovina / Museum of 105. motorized brigade / Municipality of Centar. 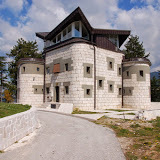 Guided tours of the Sarajevo fortification system; hiking tour to nearby mountains. opened every day except Monday, Tuesday to Friday 12:00 – 18:00 and weekends 10:00 – 18:00. Minibus line for Barice exists, but irregularly. Reachable by cab, bike, or hike.